I also notice plenty of “shorthand” stating that Part 15 AM outputs 100 mW (1/10th Watt). Perhaps I’ve contributed to this by insisting that “the final output stage” is logically the antenna and not the final RF amplifier. Perhaps the now legendary Talking House ATU (Antenna Tuning Unit) contributes to this by having their ATU certified as the final output stage. Every “fact” about part 15 opens an argument of some kind… consider the ground lead, the debate between 3-meters and 10-feet, the definition of “interference”, news talk topics banned as “politics”, narrow views on “persons new to part 15” who don’t want to hear about printer ink and the actual number of laws of physics. And, in fact, the actual output at the antenna is probably a great deal less than 1 milliwatt, unless you have great ground conductivity in your area and an ideal, outdoor installation. It’s pretty amazing what <1 milliwatt can do. This reply was modified 2 months ago by ArtisanRadio. I have never understood why, if a final RF amplifier is just that … an amplifier, how you have less at it’s output than it’s input? This reply was modified 2 months ago by Mark. I read the article and the different types of amplifiers but amplifier still means what goes out is a larger replica of what went in. A basic one transistor amplifier is basically that. The signal out is larger than the signal in. With an FM transmitter the final amp brings up the power to the desired wattage out at the antenna which is the load for the amplifier. Now to AM transmitters. Why is it different here? If you have a final amplifier to get a given amount of power going into a radiator how can the audio signal be less than what was applied at the input? That’s not an amplifier any more it’s a resistor! Why not just use that instead!!! I don’t get it! 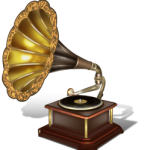 How can you have for example, HI/FI components…..a pre-amp and a power amp and at the output of the final….the power amp, which drives a speaker instead of a radiator, have LESS power out then the pre-amp did? Why is it called a final amp if there’s not only no amplification but a small amount of what was applied at the input. In that case if you take the output from the INPUT to the final you will have the full 100mW. No? I believe it comes down to the fact that you’re measuring two different things. Apples to oranges. Input is a measure of electricity, determined by current/voltage. Output is a measurement of RF. You’re measuring two different things. e.g. you can’t put a VOM or VTVM on an antenna output and directly read output in RF watts, but you can use it to measure current input. Input current is always more than RF output. Look at any ham transmitter. They’re sold by input, but that’s never what comes out as RF. It’s like resistance and impedance. Both measured in ohms, but two different things. A 16 ohm speaker does not measure 16 ohms resistance. My first ham transmitter had 25 watts input. I was lucky to get 18 watts RF out of it. Can’t go into it further, heading off to work. That was a good question, and a good answer! And — I forgot to mention, a good part of that loss is the process of converting DC to RF. Most often given off as heat. I tried to edit and add that to the above post but the forum refused to let me edit that post, or to add a new post. So I’m doing this from work! Hope this is only a fluke. But about the situation with output being seemingly less than input… I think it’s what is called “counter-intuitive”. I like to hear it explained every once in awhile. Tim’s explanation was a good attempt at me understanding it. But to follow up. Why isn’t it like this with FM transmitters? And since you have 100mW at the input, the 100mW being a product of voltage and current, what if you took the antenna from before the INPUT? WAIT!…..I may have an answer for this(may or not be right). The key word is UNMODULATED(no audio applied)…….100mW unmodulated into the final. I do know that when you modulate a signal you loose transmit range. I know with FM the rules for Canada says 100uV/m @30 meters UNMODULATED also. We know that there would be no point to have a transmitter with no modulation so the actual output at the final is less than if it was unmodulated. An unmodulated carrier will travel farther than a modulated one. That must be true with AM too? Stereo needs more umph behind it because more info has to be transmitted and is spread out more in the bandwidth than mono is. But now it’s confusing again….when you apply audio you are modulating the input to the final also are you not? Or maybe it’s designed to modulate the final only? The apples and oranges is an unmodulated carrier and a modulated one. So with the AM or FM transmitters if you apply audio you are loosing power. But it still leaves the question…..if 100mW unmodulated is applied to the final amp. and no audio is applied, why wouldn’t you have more at the output of the final than the input? Maybe I don’t have the answer. I give up! Its IS like this with FM transmitters. The loss is strictly due to the efficiency of the process of converting DC to RF. AM actually increases range with increased modulation. Many will argue this, but it’s easily demonstrable with both commercial AM transmitters and a Part 15 transmitter. Modulation on AM is accomplished by varying the amplitude of the carrier — your peaks are raising your output. Watching an AM field intensity reading on an analog field strength meter you can watch the average field intensity increase with modulation. Also, more modulation = louder audio which covers more noise, making the signal useful for a bit further. This is one reason why good processing can get a bit more range with a Part 15 transmitter. FM is modulated by varying the frequency of the carrier, it really has no effect on output. Even today, I work at a station where we compute our commercial transmitters output. To determine output we multiply plate current by plate amps, and adjust for transmitter efficiency (say, 87%) and feed line loss to determine output. We multiply that output times the gain of the antenna for ERP (effective radiated power). You don’t get more output from the final at the output due to loss converting DC to RF. It seems a little clearer to me now. Thanks Tim. Would be simpler if the rule referred to actual power out at the input to the 10 ft. antenna, realistic to what actually gets fed to the antenna. How did they come up with input unmodulated to the final anyway? Also what if you got a very high power amp as the final and even with the loss had a lot of power at the antenna but still with the 100mW into the final would that be legal? In a special sense (you may correct me if I’m wrong) it’s a matter of converting DC to AC. But it’s not common 60-Cycle AC, it’s AC at the RF frequency. But consider the question in my above post. The rule doesn’t say anything about actual usable output at what matters…. the 10 ft. antenna. @ Mark: Answering your question, since the power output is in fact minuscule < 10 mW, and with an unpredictable load impedance, it’s simply easier to specify input power as V * I to determine the power whether it be transistors or tubes. Also, even if the load impedance was fixed acquiring a measurement device at such a low power levels is difficult. With regard to “unmodulated,” an AM carrier as Tim pointed out varies with the amplitude of the amount of audio applied. As with varying audio power that one might experience with music or voice the V * I measurement would not be constant. Assuming voltage to the collector or plate is well regulated, the current would have swings with modulation. Therefore for measurement purposes the power input is observed with no audio applied. What that means is that if the RF amplifier output stage is more efficient, you get a better field strength. Just like if your antenna, loading coil, grounding is well designed you get better results. There appears be some general confusion concerning the meaning of the term “input power” as it applies to an r-f amplifier. It is not the r-f input power supplied to the amplifier. It is the d-c (direct current) power that is supplied to that r-f amplifier – which enables it to amplify that r-f input power. The r-f output power of an r-f amplifier depends on the d-c to r-f conversion efficiency of that amplifier, which depends on its design and adjustment. Such efficiencies typically can range from about 30% to about 90%. They never can exceed 100% for any/all operating conditions. So, for example, if the d-c input power to an r-f amplifier stage is 100 mW, the r-f input power to it is 2.5 mW, and its r-f output power is 50 mW, then the amplifier has a power gain of 50/2.5 = 20 (13 decibels), and its operating efficiency is 50%. 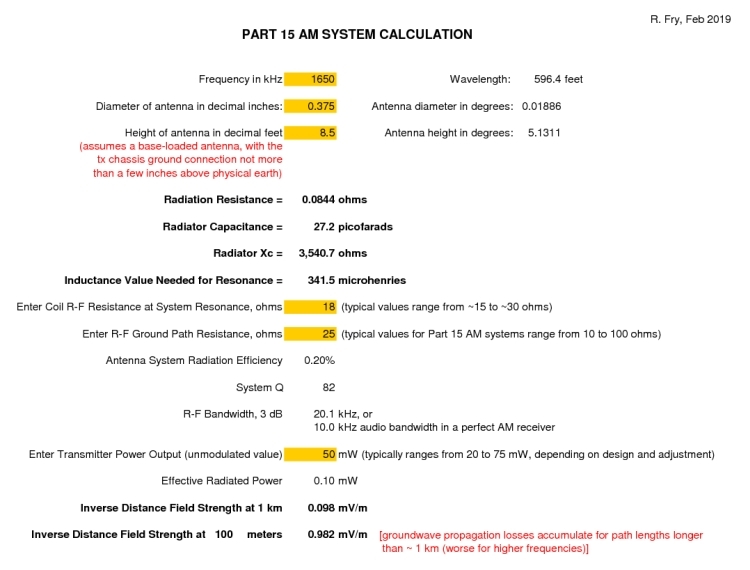 However not all of that 50 mW of r-f output power is radiated by a Part 15 AM antenna system. Nearly all of it is dissipated as heat in the matching loss resistance of the loading coil plus the connecting path of the transmit system to r-f ground (the earth). The FCC was wise _not_ to specify an upper limit for r-f output power for Part 15 systems, because accurately measuring it requires specialized, and expensive test equipment that almost nobody would have, or want to buy. OTOH, measuring the d-c input power of an r-f amplifier can be done by almost anyone, using a simple and cheap multimeter. Thanks guys for explaining it! That is a big help, thanks. RE: “So, for example, if the d-c input power to an r-f amplifier stage is 100 mW, the r-f input power to it is 2.5 mW, etc.” That is a big help, thanks. Good, and thanks for saying so.